“Santa's Bag Of Magic” from Christian Faith Publishing author Venyce Van Buskirk is the story of a girl who asks for a bag of Santa’s magic. When Santa grants Addyson’s wish, she will discover the true magic of Christmas. “Santa's Bag Of Magic” is the creation of published author, Venyce Van Buskirk, mother of seven and grandmother of eleven. Venyce loves to serve her family, church, and community. Her most treasured moments are spent with her grandchildren. It was during an outing with three of her grandchildren that this story took root. Her love of Christmas and the inspired true events in this book is what prompted Venyce to write her own Christmas story. Published by Christian Faith Publishing, Venyce Van Buskirk’s new book is the true story of a young girl who discovers Santa's magic. Addyson patiently waited in line for her chance to see Santa. At the age five, she knew exactly the right thing to ask for. She wanted a bag of Santa’s magic. When Santa decides to grant her wish and shares the virtues of Christmas with her, Addyson spends the next few months discovering an unexpected magic of her own. View a synopsis of “Santa's Bag Of Magic” on YouTube. 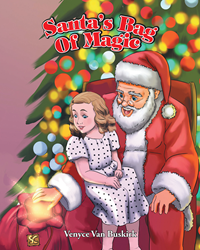 Consumers can purchase “Santa's Bag Of Magic” at traditional brick & mortar bookstores, or online at Amazon.com, Apple iTunes store, or Barnes and Noble. For additional information or inquiries about “Santa's Bag Of Magic”, contact the Christian Faith Publishing media department at 866-554-0919.